Discover the secrets of the Maldives night sky. On a breathtaking private island where the forces of nature dazzle the imagination, SKY invites you to play out once in a lifetime journeys, immersed in Time and Wonder. Ascend for lounge cocktails as a sunset tapestry unfolds. 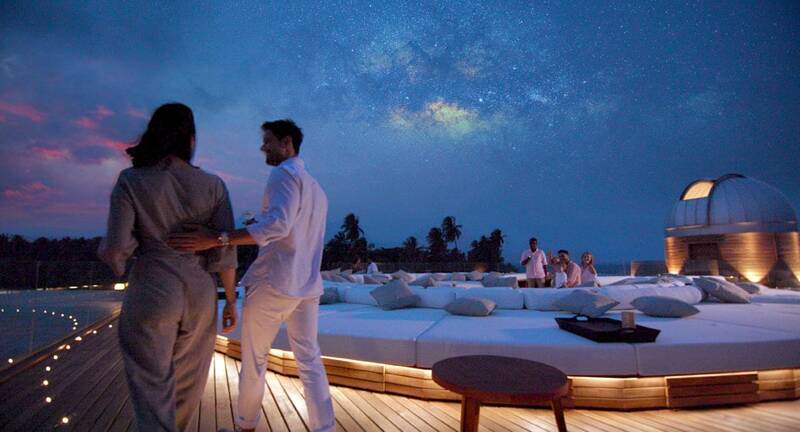 Expand your view of the galaxy at the Maldives’ first over water observatory. Stargaze through the Maldives’ most powerful telescope. Learn about the constellations and planets with our storytelling SKY Guru. Discover extraordinary experiences that enlighten couple’s romance and family adventure. Lay back on a circular daybed to gaze at the stars that glitter overhead, regaled by our SKY Guru’s fascinating insights. Spot the pale yellow rings of Saturn or the counter-rotating zones and belts of Jupiter that vary in width, colour and intensity from year to year. Peek through the telescope at the Milky Way’s shining Omega Centauri or Messier 13, a globular cluster of over 300,000 stars in the constellation of Hercules.